I reported back to Huddersfield and we were sent to Kirkburton, a small town nearby. That night we were put on a train, locked in, and got out the next morning at Greenock, near Glasgow. We went straight to the docks, onto a tender and out to a ship in the harbour, the S.S.Samuel Chase, an American ship with American crew. We were on our way to Africa as reinforcements for the 1st Army. We joined the convoy the next day. It was quite an exciting journey, with many warnings of U boats. One troop ship was sunk when we were a day out from Algiers, where we landed and made our way inland. For the first couple of months we were doing odd jobs in Algiers. The most telling story was the time we were train guards. The goods train went from Algiers to the front with food and ammunition for the troops. During the journey, as the train went round corners in the hills it had to slow down and the Arabs would jump up and throw off the boxes. Our job was to stop them before they could throw anything so we were told to shoot them. We went from carriage to carriage, and if they were lying in the train we would kick them off. When I look back I feel terrible. This however was very tame when I think of some of the other troops that were on the allies side. The Moroccans called Gouma, were soldiers of fortune. They were paid so much money for every prisoner they brought in and less for every enemy soldier they killed. They couldn’t bring in dead men so they got paid for every right ear, which they carried in a pouch. The other fierce soldiers were the Gurkas, with their war cries and the kukri, a knife; they were absolutely fearless. The joke going round was one day they raided a German camp, and one German said to another, “They never touched me”. Then his head fell off. When I got back from one of the guard duties I was posted to the 46 infantry division of the 128 Hampshire Brigade Signals, at Beja. This was my initiation, the real way. At Beja I met a friend of mine from Huddersfield, Phil Dodd. The last time we had been together we were eighteen years old, dating girls, learning to dance, Sundays in the park, clicking, not a care in the world. And here we were not twelve months later, nineteen years old, in our first battle, scared out of our wits with death all around us. As we arrived at Brigade Headquarters, we were getting bombed by Stuka bombers, so I dived into a slit trench. Then we were shelled and mortared, and it was obvious with all the dead and injured that we were going to need a lot more reinforcements. Just then the Germans counter attacked and we were forced to retreat, so my first action was going backwards, not forwards. As we were retreating, Phil got hit in the stomach. I crawled over to his slit trench, to try and dress his wound, but it was terrible. His guts were spilling out. Thank goodness he died quickly. Nineteen years old – what life had he had. At least he died with someone he knew. After withdrawing a short way, we held our ground, regrouped and stood firm until we could get some reinforcements. Eventually we were able to advance again. 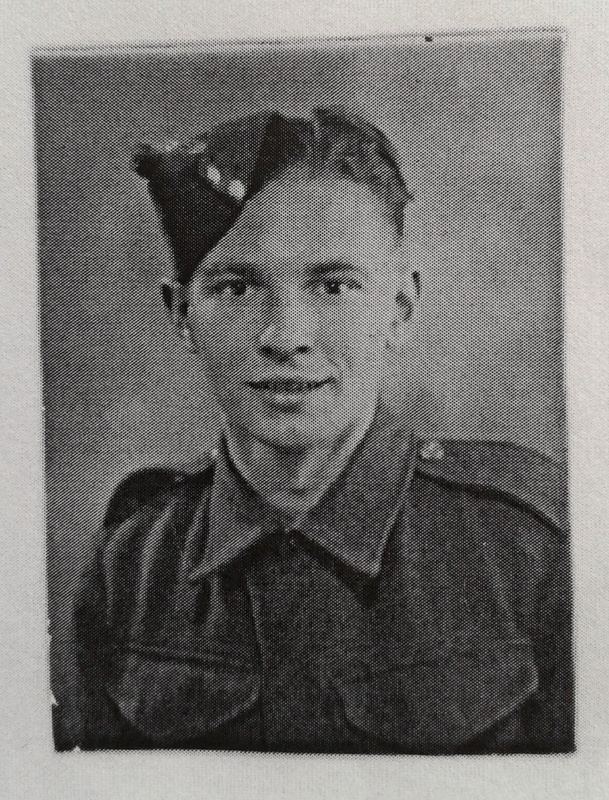 I learnt after the war that a friend of mine from the Bowden Avenue gang, Teddy Walsh, had sent the last message before the ‘Glorious 155th’ Division as they became known were overrun by the Germans. He was taken prisoner and spent the rest of the war in prison camps. Unfortunately he contracted some disease, from which he never really recovered, and died a few years later. It was now January 1943, and it was a continual slog up the Djebels (Arabic for mountains). We had enough coping with the terrain and the weather without having to fight the Germans. However, we fought relentlessly until we met the Eighth Army at Tunis and finally defeated both the Germans and the Italians. I was with the Hampshires on Cap Bon when the Germans surrendered. It was an incredible sight. They drove in trucks and marched in their thousands in orderly ranks to give themselves up to any British soldier. The whole performance was carried out with complete discipline. It was a very hot day, and a quarter of a million prisoners came in who all had to be guarded and fed. There was a marked difference between the Germans and the Italians. The Germans, I’m sure, thought they would only be prisoners for a short time until they won the war. They still sang their marching songs like the ‘Lily Marlene’. The Italians were a disorganised rabble. There was much celebrating in Tunis. The wine flowed and there were many drunk soldiers around, me included. However it was all very different on May 20th, when we held the victory parade in Tunis. In the hot sun, the national contingents marched past with General Eisenhower and General Graud (French). The citizens of Tunis went wild with excitement, we had our best uniforms on, and all that drill we learnt with Sergeant Archer proved worthwhile. He would have been proud of us. They called it the ‘Avalanche’. All summer we trained with sweat and tears; the blood was to come later. We had our moments however in the bars of Tunis and Bizerta. Mostly though, we practised – beach landings. We didn’t know where we were going, and obviously didn’t know about ‘H’ hour, and ‘D’ Day. Many people think there was only one ‘D’ Day, in France, but there were many. We had already had one ‘D’ Day in north Africa and had travelled two thousand miles to get there. Our second was to be Salerno, on the Mediterranean side of Italy, just below Naples. The 46th Division was originally going with the Eighth Army to land on the toe of Italy, but we joined General Mark Clark’s American Fifth Army as an assault Division. That meant we went in first. We’d been given extensive training in combined operations, working very closely with the 2nd Commandos. Combined operations was a very intricate form of warfare which was still in its experimental stage. Dieppe had been the first costly experiment which had failed with many dead and wounded. The North African landings had been practically unopposed, but some experience had been gained. Sicily had been the first landing with large scale airborne troops. This had been successful and Salerno followed, a landing at the very extreme limit of fighter range. We carried out further training in landing craft and trained in the heat of the hills to grow hard again. We were sailing from Bizerta and as the landing craft were gradually gathering the enemy obviously knew something because the air raids were very heavy and continual bombs crashed in around the town. The convoy was largely untouched. At dawn on 7th September we set sail. It was not a calm blue Mediterranean sea that first day out and everyone seemed to be sea sick. We made an unscheduled stop in a remote part of Sicily which was very welcome. It had been cleared of inhabitants and early the next morning we got under way again. As we went we were joined by ships as far as the eye could see, all moving towards Italy. That afternoon German planes flew over the convoy and later bombers appeared. Attacks continued throughout the night and one ship was hit. It made a terrific glow in the sky already alive with lines of tracer bombs. In the evening an amazing announcement came over the speakers “Italy has surrendered”. We all relaxed and thought that we would walk in and be greeted with Vino and beautiful Italian girls. I was going in with the first wave at about 4am with the 2nd Hampshire Battalion. We were stood off in the bay at Salerno and the rope ladders went over the side. I wrote my last letters and a had a drop of rum and climbed onto the rope ladder with my wireless on my back, thinking if I let go and fell I’d break my neck before I touched land. With my gun and wireless set on my back, over I went into the assault craft. We approached the beach, code named Green Beach, and as the ramp went down we poured out, up to our waists in water. All hell was breaking loose, mortars, shells, tracers, everything. Men were falling even before they got out of the sea. As soon as we got to the beach we pretended to be moles and waited for the next order, and it soon came, “Come on forward”, mixed with some choice language. Who will ever forget the password ‘Mailed Fist:Hearts of Oak’ . The boats landed us on the wrong side of Green Beach, which was raked by machine-gun fire from the hills in front of us. The shells and mines tore up the sand, and the dead and injured lay around me. The first wave dashed forward across the open beach and by the time the 5th Hampshire landed fifty minutes later there was only one German gun firing. When daylight came up, I saw the mess. Stoney Knowles landed about 9 or 10am with the 138 Brigade. He knew I had gone in with the Hampshires, and had seen some wounded being carried back to the ships. He asked if they knew me and they told him I’d been killed. A little later that morning the KOYLI had gone through us and were preparing to attack when the counter attack started. Tanks came down the narrow stone walled track, later called Hampshire Lane because of the terrible casualties. We had been stuck in Hampshire Lane and I had been slightly wounded; a piece of shrapnel had torn into my thumb. Somebody put a field dressing on, but when I was hit I’d left my wireless set in the middle of the lane. Every part of the lane was covered by snipers and a tiger tank was pumping 88mm shells at us. I was behind a wall feeling sorry for myself when suddenly I heard my call sign on the wireless. What to do, do I go and get it and risk not getting back, or ignore it. Then an officer came up behind me and said “Is that your set?”, “Yes Sir”, “Well bloody well go and get it”. So I went and grabbed my set and got back behind the wall. The officer stayed behind the wall! However, because we had the radio and could keep in touch, he decided to take some men and put the Tiger tank that was causing so much trouble out of action. “You you, and you, get that Piat mortar and follow me.” We crept forward and couldn’t see the tank until it came out of this railway tunnel, fired a few rounds then went back out of sight. We were ready when it came out the next time, and knocked it out and made our way back. Then a young friend of mine was brought back. He had been hit in the face, and was in a mess. All the time before he died he was calling for his mother. We were on that beach for ten days and we took a terrible battering, but gradually we advanced, yard by yard, until we had established the beach head. Then I could get my wound looked after and we knew that we weren’t going to be pushed back into the sea. Salerno was just the beginning of the war in Italy and we had to fight for every yard. We couldn’t have been further from the truth when we thought it would be easy because the Italians had capitulated. We fought in all weathers, in the heat, in snow, with mud up to your ankles in pouring rain, you mention it, we had it. The Germans disarmed the Italians so we were just fighting them, but knew the Divisions we were up against from the African campaign, and they were the elite of the German army. We gradually took Naples, and then were relieved for a short spell and managed a few days leave in the city. The Italians were in a terrible state. Every town and village had been completely wrecked, and they were very short of food. They would sell their wives and daughters for a tin of bully beef. The British troops helped as much as they could by sharing their rations and we would always save our chocolate ration for the children. Italy was criss crossed by rivers and hills and the first obstacle that held us up and caused many casualties was the river Volturno. The Germans had two good Divisions along the river opposite us, the 15th Panzer Grenadiers, and the Herman Goring Division. The river banks were steep and wooded and the river itself was broad and unfordable. All the bridges had been completely demolished and we were short of bridging equipment. We went across in DUKWs (amphibious vehicles) and were under heavy fire all the time. We also had assault boats that we had to carry along the muddy banks until we got to the water. It was exhausting. We got across but were then driven all the way back. Two officers and six men with Bren machine guns covered the withdrawal. We had about fifty casualties, but after a further attempt we stayed on the other side. The Sherwood Foresters on our right lost about two hundred men in the eighteen hour battle. By the 12th or 13th of October 1943 we had secured the other side, but the fighting over the next four days was confused, in fact very confused and difficult. The weather broke and it rained. I thought Manchester had a name for raining but it was just a drizzle compared to here. The vehicles were totally bogged down, but fortunately so were the German’s. So on we went at two speeds, ‘dead slow’ and ‘stop’. In November we came to the River Garigliano. We were still in the American 5th Army who had five divisions. The Germans brought two more Divisions down from the north, making them up to seven. I don’t want to go into the details of the crossing, but suffice to say it was a re-run of the Volturno but much worse. Time after time we attempted to cross but were forced back. No battle that I fought in impressed itself so indelibly on my memory as the crossing of the Garigliano. Winter had settled in and it was cold, with snow on the hills. The Germans were installed on the commanding heights and our plan was to capture Mount Camino, with its two narrow ridges known as ‘Razor Back’ and ‘Bare Arse’ leading up to a white monastery. The route was known as ‘Monastery Hill’. This area was known as the gateway to Rome, which was our objective. There was a strange eeriness about those days. It was not unusual for German patrols to ambush a Jeep and its occupants and take them prisoner. There was a road below Rocca d’Evangro known as the ghost road where many soldiers vanished. We occupied the castle and went up the mountain with the equipment carried by mules from the Italian Alpine troops. It was quite an arduous climb and after we had been there a couple of days I got a pain in my side. The medical orderly thought it might be appendicitis so I had to go back to base on a stretcher Jeep which went along the Ghost Road. The Jeep always went in the dark but we made it and I was transferred to a hospital where they decided that it wasn’t appendicitis so back I went up the mountain again. The route was heavily mined and many of the orange groves were booby trapped. Sometimes the enemy went as far as to booby trap their own dead. One of my friends was foolish enough to go into an orange grove for oranges and trod on a land mine. He lost a foot and off he went to hospital. As usual, if they didn’t get posted back to the unit we never heard from them again. Around this time I caught Malaria. I felt as if I was dying. I was taken to hospital and the nurses kept sponging me down to keep me cool. I was flown to an American hospital in Sicily where I got the best treatment. The nurses had not had a ‘Limey’ (as they called me) under their care before, so I got special attention. They loved to come and sit on my bed just to listen to me speak. Most of them had never seen or heard an Englishman before. Everything was great until I then caught Yellow Jaundice in the hospital. I was shipped back to Naples and put in a transit camp. It was dreadful, no organisation, bad food, the tent let water in and the worst thing I heard was that we were not going back to our own units. The plan was that we were to be used as reinforcements elsewhere, so I decided to leave and make my own way back up to my own unit at the front. It took two or three days to reach them and when I got there and reported in I was told that I had been reported A.W.O.L . (Absent without leave). In a war zone this was a court Marshall offence, quite a shock, but fortunately as the unit was at the front my officer said he would square it. As I never heard any more about it I presume he did. We were looking forward to being the first in Rome, but General Mark Clark, the American General C.O. of the 5th army changed all the plans so that American troops would be the first to enter the city (the fool). So off we went again clawing our way yard by yard up Italy until we came to the next obstacle, Cassino. The battle of Monte Cassino has been well documented many times so I will just say that there were many tough battles and the monastery was bombed out of existence before General Ander’s Poles took Casino and what was left of the monastery and opened the way to Rome. The Division was certainly in need of a rest. Since the landing at Salerno nearly six months passed and there had been little respite. The last three months had been in the snow and rain of a bitter Italian winter with often only a slit trench or Sanger for shelter on the bleak hillsides (a Sanger was a shelter built of stone when it was impossible to dig a slit trench). Our endurance had been tested to the limit, and even the periods out of the line entailed long marches, burdened with kit, to reach the cheerless haven of a battered village or small town, where after a few days rest of doubtful comfort we were faced with a long march back. Casualties had been heavy. Most units had been reduced to half their strength and reinforcements had been thrust straight into battle and the barrels of the field guns had been worn smooth with their constant firing and their accuracy impaired. So ‘Pitchfork’ was the code for the most popular operation. We arrived at Quassas in camp where there was a NAAFI and a dirty old cinema. We got our leave passes for Cairo, and were given credit to draw money from the bank. We had plenty as there hadn’t been much opportunity to spend money in the mountains of Italy! It was indeed wonderful to see how much money could be spent in a few days in a town like Cairo. Spend, spend, spend was the name of the game, because who could tell if you would ever need money again? Cairo had been set up with shops, night clubs and cabarets. For the soldiers coming from the battlefields of Africa and now Italy, a must was to escape to the ancient pyramids and the Sphinx at Mena. There again we were besieged by camel owners, photographers, postcard sellers, beggars, hawkers, and fortune tellers who drew mysterious figures in the sand in the shadow of the Sphinx. Not many of us wanted to know about our futures. Mena House and Gezena Sporting Club offered an endless variety of entertainments. The alcohol flowed and consequently lots of trouble followed. Fights broke out in nightclubs and much damage was done. I remember seeing a tram car turned over and shop windows broken. At one point we all lost a week’s pay but we all felt at the time that it was worth it and in one way or another our Division left its mark on Cairo. After the break we had a five hundred mile journey to Palestine, across the Suez Canal and through the blazing bareness of the Sinai Desert. In this boundless waste it was surprising to see small encampments of Arabs. They had a lifetimes job of clearing the road of sand, and they all turned out to see our convoy pass, shouting “Cigarette Tommy!” As we approached Palestine, its patches of glimmering green were a joy to behold. No wonder the Israelites thought it was the promised land. It was not all rest here and we sweated, training amongst the sand dunes. It reminded me of Squires Gate sand hills, but instead of being below freezing point it was over 1000F. Here the Division was brought up to strength and we went through strenuous courses with a final test of fitness, exercises and aggression. We also had good times here. Tel Aviv and Haifa were not too far away and offered every sort of attraction. Tel Aviv seemed a beautiful seaside resort and was well organised. It was mainly occupied by Jews, and no-one needed to be without a party or a house to go to. Both were clean modern cities, and it was also possible to visit Jerusalem and Bethlehem. Palestine was a scene of ill feeling between the Arabs and the Jews and at one time we had the job of patrolling the streets. However no clashes occurred and considerable hospitality was offered to the patrols. So, we had a very pleasant time lazing on the beach and swimming in the Dead Sea where it was impossible to sink. From Palestine we moved to Syria and I caught Sand fly fever and had a spell in hospital. In Syria a final polish was put to our training; “Djebel training” was a daily performance. Damascus and Beirut were the two main cities and this was a most memorable part of our rest in the Middle East. We had a long glorious journey through the Lebanon where even in the heat the mountains were capped with snow and colour ran riot on the hillsides. Beirut was a fantastic city, so different from the Beirut we now know. Damascus was a real mix between old and new and it had been the richest trading centre in the Middle East. Even now the Baz was ablaze with golden ornaments, rich carpets and pure silk. We could have stayed here for ever but the long arm of war was reaching out for us and the long trek back to Egypt began. The news was good. Rome had fallen and there would be no more battles in the well-known eerie hills of the Garigliano. The invasion of France had a firm footing off the Normandy coast and there were high hopes that we were destined for home and then to France, anywhere but Italy. But when the boat sailed, it headed for Italy. The Division landed in Italy and moved north through the rubble of Cassino over which the smell of death still lingered, through Rome and northwards. This time we joined the British Eighth Army and we moved forward on August 15th 1944 to take up our position on the Gothic line. At this time I changed my job. From being attached to the Hampshire Battalions I was promoted and made Brigadier Douglas Kendrew’s personal wireless operator. A friend of mine, Les Dukes was made his personal driver. The Brigadier, or Joe to us, had just been promoted from Colonel of the Yorks and Lancs Battalion, so we were a unit. Good move, I thought, a bit more cushy – wrong! Joe was a man who had no fear. He made a point of being out with the infantry battalions, visiting their headquarters in all the forward positions. He carried a revolver at his side and could shoot an orange off a tree. He had been a famous rugby player, playing for England before the war. His code name was ‘Sunray’, so we would get a message on the wireless, “Sunray, enemy counter attacking in such an area” so off we would go. We always had a few tins of Irish stew and a tin opener in the Jeep and all three would eat it cold, nice and greasy. Joe taught me how to be satisfied with three hours sleep a night. He said that as long as you’re lying down and resting your body, you didn’t need to sleep because it is your body more than your mind that needs the rest. We had many exciting times together. I remember on one occasion the three of us were in the Jeep going to a forward position. We were travelling down this road. I was map reading and as we approached a crossroad we could see mortars were straddling the road up ahead and coming in our direction. On our right was a burnt out tank and Les and I had the same thought. Les brought the Jeep to a stop and we both leapt out and dived behind the tank. “Come back here” we heard Joe yell, so we came out from behind the tank to see him sitting there completely unperturbed. We went back feeling a bit ashamed of ourselves and got back in the Jeep. Fortunately the shelling stopped and on we went. Joe said nothing about it apart from turning round after we set off and said “Exciting isn’t it?”. There were many such occasions and many near misses. There were very sad times too. One time we went in after an early morning attack by the infantry. Dead bodies were scattered in the field. Sometimes their clothes had been blasted off by the shells, and dead British and German soldiers were lying together where there had been close quarter fighting. The worst memories were coming across soldiers who’d been through terrible experiences. They’d be huddled together in a state of shock unable to speak properly. There would also be groups of young German prisoners in the same state. The Brigadier would always get the bodies moved first. There was nothing worse than troops going into battle and seeing dead bodies around. Even now, fifty years afterwards, I still see snapshots of these scenes in my mind. So on the Division went fighting every yard of the way towards northern Italy until the beginning of October 1944. The next big attack we were to make was the crossing of the Frimicino. This area of Italy was a mass of rivers and mountains. The 5th Hampshires were about to cross the River Uso when we found that it had changed from a narrow stream to a raging torrent fifty yards across. We had to remain on the near bank all night, and the next morning managed to wade across it chest deep. Two days later as we dug in the river fell as quickly as it had risen. The attack went on and we took a small village, Montalbano. This was the first time we encountered papier mache mines. All its fittings were made of glass so that mine detectors were useless. The 2nd Hampshires were set to capture a village called Montilgallo which was very well defended and held us up for six days. The weather was terrible with the rivers flooded and vehicles bogged down. Many of the guns were up to their axles in mud and it was impossible to use tanks. Constant patrolling built up an accurate picture of the enemy positions on the Montilgallo spur. Opposite the Hampshires was the German 278 Division. They were well known and tested, and commanded by the energetic and eccentric General Hoppe, who was reputed to be willing to sacrifice any number of men to win oak leaves towards his Knights Cross. The original plan had been to assault the steep sides of the spur, but unfortunately, two of our officers had been captured with marked maps and orders in their possession, and all the plans had to be altered. The date of the attack was constantly being put back but eventually under a deafening storm of artillery, mortar and machine-gun fire, the leading Companies began to move down to the river. The 2nd Hampshires had the impressive task of capturing the spur and the 5th Hampshires were held up just over the river. Shortly before midday an enemy wireless message was intercepted which disclosed an impending counter attack, heralded by very heavy shelling. The Commanding Officer of the 14th Hampshires was severely wounded. I’d taken the message and we were heading for their headquarters when I got another message for ‘Sunray’. Lt.Colonel Rotherham’s headquarters had been reduced to himself and his Battery Commander and they were expecting a counter attack. The message also said that the shelling and mortaring were overwhelming them. The Brigadier immediately said we must go to see if they needed help, so off we went. The Headquarters of the 2nd Hampshires was in a farmhouse. When we arrived the sight was unbelievable, and I find I can hardly put it down on paper. I had seen many terrible sights since entering the war but this was beyond them all. As we were getting near the farm we could see two hayricks on fire. The farmyard was littered with dead bodies, with shattered legs and arms blown off them. The Germans had also been using phosphorus bombs, and there were half charred bodies absolutely unrecognisable. The medics were methodically going round to see if they could help anyone. The Brigadier leapt out of the Jeep and went into the shattered farmhouse. Les and I got out and I was behind the Jeep with my headphones on listening for messages when a shell landed and blew us off our feet. I was hit in the leg and the hand, and Les in the legs. Eventually we were taken out by jeeps, and I became separated from Les. I had my wounds dressed and was taken to hospital, and a couple of weeks later I found out that Les had died on the way to hospital. It was the end of an era. The Brigadier went back to run the Brigade, Les was dead, and I was in hospital for quite a while. A good team was finished. The battle for Montilgallo spur had been a hard one, remarkable more for the enemy shelling and appalling weather conditions than for close quarter fighting. There was seven days torrential rain, but when I got wounded it was the end for me. I was away for about three months, and when I re-joined my unit they were out of the line, resting. 128 Brigade were in a small seaside resort called Cupramarittima. It was December 1944 and we were to spend Christmas there; we were hoping that this would be the last wartime Christmas. A Vermouth factory that had been captured had yielded a good supply and it was amazing how many chickens and the odd pig had been reared in the rear areas. It grew much colder and there was snow on the hills. When I arrived back from hospital the unit had settled in rooms in houses that had been allocated to some of the troops. I was put in a room with two others but within a few days they were transferred to another unit. The mother of the house, who I called Mama came in my room, which was empty apart from my kit and a bedroll, and moved me into a better bedroom. She put a warmer in my bed every night and looked after me. She knew that I’d just come out of hospital, and her husband had been in Italian Libya before the war and had not come back to Italy – she didn’t know what had happened to him. She had a son aged about twenty five and a daughter who was eighteen. The daughter’s name was Ortensia, and in a very short time we fell for each other. We spent a lot of time together if we were in the house, but if we went out we had a chaperone, Mama or her brother. If we went to the pictures Mama would come and sit in between us. I wrote home to my mother and told her I might be bringing an Italian girl home with me and received a telegraph back saying “Don’t bring any Italian girl here”! I was pleased I had not said too much to Ortensia because I was in quite a quandary, but in the end everything was decided by the army. We were told just after Christmas that training would start again, and we were ordered to get our kit together and be on parade by 5.30am the next morning for three days exercise. Before I went to bed I said goodbye to the family and said that I would see them in three days. I never saw any of them again. Instead of training we were put on a boat and went to Greece which had just been freed from the German army. Unfortunately the different political factions were fighting and we were sent to keep the peace. The Communists were strong and had all the weapons that the Allies had dropped for the partisans during the German occupation and their army, ELAS had been trained by British Officers. However, they fought like terrorists, and would shoot a soldier from behind a wall then vanish. There was also hostility between ELAS and the Greek police who were accused of association with the Germans. On January 25th we were occupying a small village. The date is very important to the Greeks because on that date in 1925 after twenty five years of occupation by the Turks they gained their independence, driving the Turks out. So on this day in 1945 all the ELAS and partisans came down from the mountains, (where there had been a lot of fighting) and danced Greek dances with us and the villagers until the early hours of the morning. We slept where we fell and the next day when we got up there wasn’t a bandit in sight, they’d gone back to the hills to carry on fighting us! Eventually a truce was drawn up and we left Greece to go back to Italy.